Who doesn't have a whole collection of business cards stashed in a 'safe place' for future reference? We most certainly do! Business cards (aka calling cards) are more important than we give them credit for. I've had a client phone me up five years after taking one of my cards - yes, they kept it for that long while waiting to be able to start their own business. Strangely, people are more likely to keep your business card if it looks lovely. Who wants to throw away something beautiful anyway? But sometimes a beautiful, unique business card can be expensive to reproduce, especially if you're doing letterpress printing or embossing. 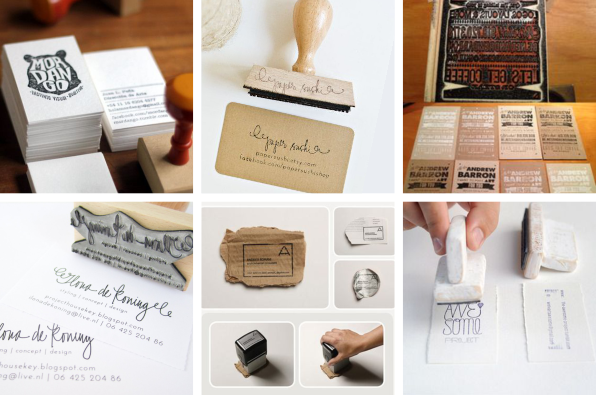 We've gone on a search and found these beautiful DIY stamped business cards. All you need is a good quality wooden-handled rubber stamp of your card design (we can arrange that for you), a selection of good inks, an ink pad, and some good quality board which you can source from any craft shop. The bottom centre example below uses torn pieces of used board and paper for a recycled goods company. Obviously it is the font and design that will make your stamped business card extra special. Check out these examples below. We love, love, love all of them.